Klopp SE Electric Coin Sorter can sort mixed coins, quarters, nickels, dimes, and pennies into four separate bins. Optonal US Dollars, tokens and non-U.S. coins are available upon request. This unit recommended for sorting wet coins & tokens from carwashes. Klopp SE does not count the coins and it is for sorting use only. 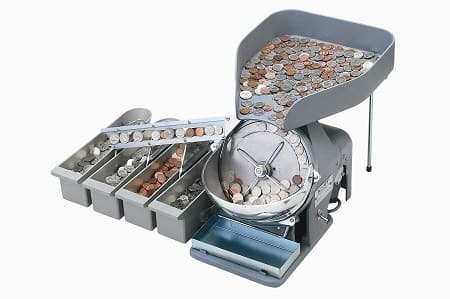 Insert quantity of mixed coins into the hopper. Turn the crank. Coins will be rapidly separated into the individual removable coin boxes.